It has been pretty tough finding great books in Portuguese for my little learners. Books, and even more so bilingual books, that are culturally relevant, are just the best. And this is certainly one of them. As you may know, I am not a huge fan of bilingual books as they tend to be books written in one language and then translated. The translated version often lacks in cultural meaning, humor and often loses much of its charm. With two children reluctant to speak Portuguese, bilingual books have become a little bit of a necessity though. Simple books are too baby-ish for them now and finding relevant stories is tough. When I was contacted by the author of this book, I agreed to take a look. And I was not disappointed. 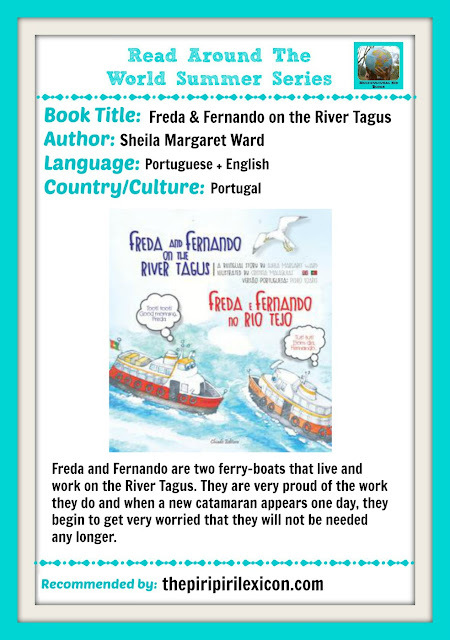 Freda and Fernando on the River Tagus was written by Sheila Margaret Ward. The story is that of two boats that carry passengers across the river on a daily basis. Their jobs are under-threat as new shinier faster technology-driven catamarans threaten to take their place. The mighty River Tagus is the river that flows into Lisbon, the longest on the Iberian Peninsula and a very important cultural aspect of the Portuguese capital. So, reading about it in a children's book is perfect for my half-Portuguese children. My husband read the book to both our children (even though it is marked as suitable from 4 years old). he has been reading it regularly since we got it: sometimes in English, sometimes in Portuguese. Both children like it. E, 2, loves it because it is about boats and he just goes "Toot" whenever the boat does. LJ, 6, likes the story and learning about a little piece of Lisbon. The illustrations are cute. The story is lovely. But what I like best is the fact that the book is written for bilingual children. What do I mean by that? 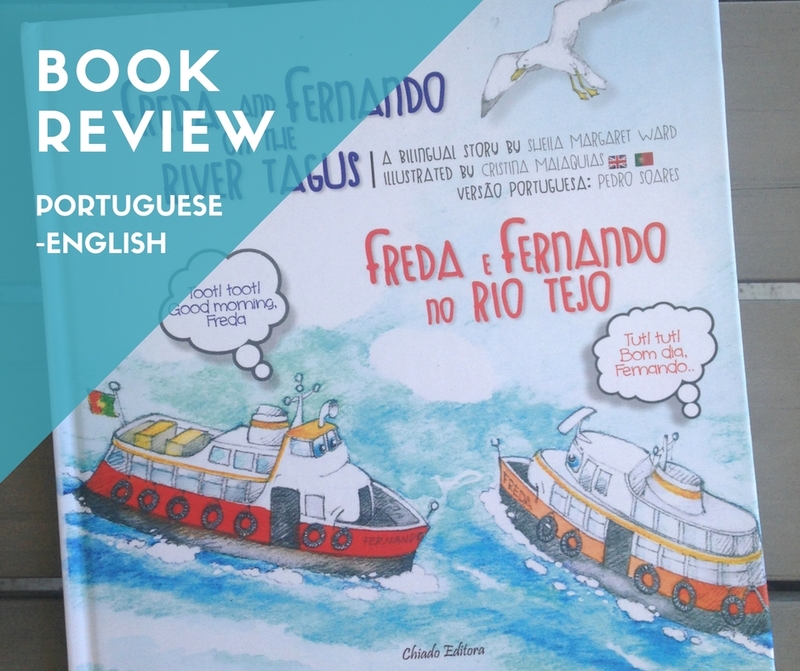 - The names of the boats and characters are (for the most part) Portuguese names (as they should be) but also names pronounceable in English. 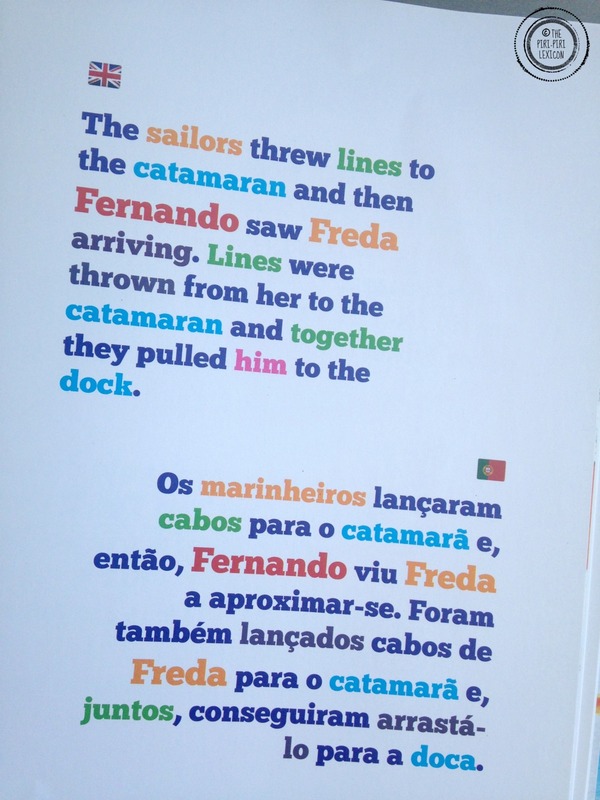 - The text is colour-coded helping bilingual children identify their translation. As LJ learns to read, I am sure this will come in quite handy. - As a book in English about Portugal, it is not stereotypical but is culturally-appropriate (the author is a British lady living in Portugal). 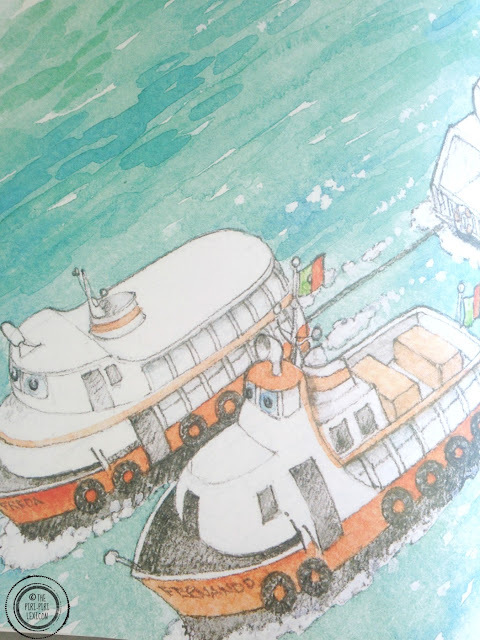 There are also a few games and colouring pages at the end of the book. All in all, a lovely "proper" bilingual book, perfect for bilingual children. I am really glad I found out about it. The book is available to buy here (worldwide shipping). There is now also a second book about the dolphins in the river (just as good as the first one). And there is even a cute little preview video here. You can find more book recommendations here and on my Pinterest board below. Disclaimer: I received a free copy of this book in exchange for my review. All opinions are my own though.